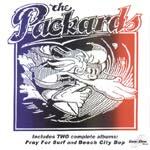 This is the long awaited CD issue of the Packards' first LP from 1980, and it's an even bigger event with the coupling of the 1982 cassette only album Beach City Bop, which contains the best version of "Wild Goose" ever! Paul Johnson's music from this period is not pure trad surf, though certainly it's within reach of an updated Belairs sound, and certainly oozes the water. An excellent release, necessary for the serious surficionado.